The origin of ley lines is entirely practical. 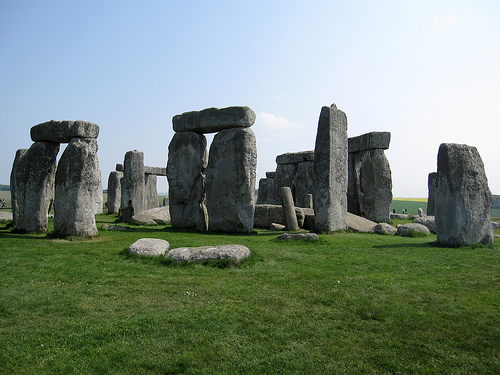 In 1921, amateur archaeologist Alfred Watkins coined the term to help describe how Neolithic Britons might have navigated the country: by walking in straight lines between various known visual markers such as standing stones and small mountains. Watkins' work helped identify a number of the straight tracks that people used in Neolithic times, some of which are still in use by travelers today. In 1969 the term was co-opted by the New Age movement and given a spiritual, magical connotation. British author John Mitchell published a book which melded Watkins' ley lines with theories of feng shui and energy movement along landscapes. In this newer sense of the term, ley lines are said to be lines of power which connect large objects and locations of spiritual significance. Ley lines are always precisely straight, but beyond that, there is little agreement as to their specific location or what they can actually do. In North America, ley lines are often said to connect many power points which were of religious significance to Native Americans. This is a tricky business, of course, and a lot of guesswork is involved. Locating and mapping ley lines is an activity which is closely aligned with dowsing. Presumably because dowsers are able to sense where the invisible power lines lie, and help map the locations of power points. Ley lines are also said to connect vortex spots. Earth vortices are said to be "hot spots of energy focus," sort of like the planet's own Chakras. These locations include Uluru (a.k.a. Ayers Rock), Tibet, Calgary, and Sedona, AZ. Unfortunately, much of the information on vortex spots and ley lines in America are locked up in products for sale, which makes this topic difficult to research online. (For example, you can order a 5x7 photo of a map of Seattle's ley lines for $7.) And many of the pages which people link to as resources have gone to 404 errors over the years, which makes it more difficult still. One way to find ley lines in your area is to spent some time perusing a map. Because ley lines are said to connect prominent sites, you can probably identify some of these sites in your area and draw straight lines between them. Look for mountains, old graveyards, and significant geologic sites such as hot springs, the confluence of rivers, volcanoes, waterfalls and so forth.